Seeing a bus shelter with a provoctive lengerie ad is where it all started. "God, if that was your Word - just imagine!" And with that thought, Bus Stop Bible Studies was launched. Bus shelter advertising can be very effective in the right application - especially brand awareness. For the most part it is 'flash advertising'; 5-seconds of a product image or logo as a car drives by. All though tens of thousands may drive by a bus shelter, detail viewing is mostly by pedestrians or comuters (typically the same people each day) who have an opportunity to view the display in close proximity. The weekly cost of a transit shelter panel can be $400 and up. The cost may be lower in remote locations to as much as four times this amount in busy downtown locations. 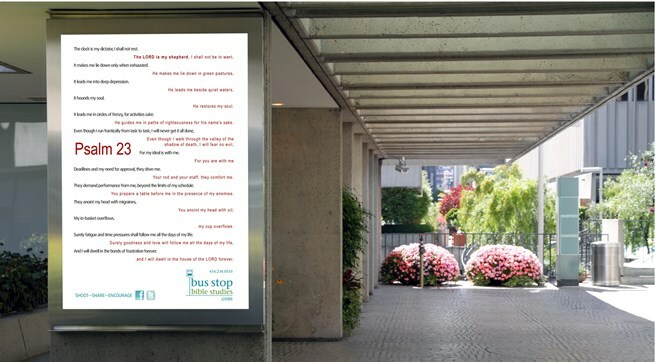 For the cost of posting a single bus shelter ad for 16-weeks, one can post 45 Standard Interior panles on the buses for the same amount of time. With sufficient notice, Bus Shelters can be targeted for specific locations/intersections.